Kim Kardashian and Kanye West are even richer today, after settling up with a YouTube founder over a video of their engagement he secretly shot and then leaked online. TMZ has learned Chad Hurley, the YouTube dude who went on to found MixBit, has agreed to pay K&K $440,000. 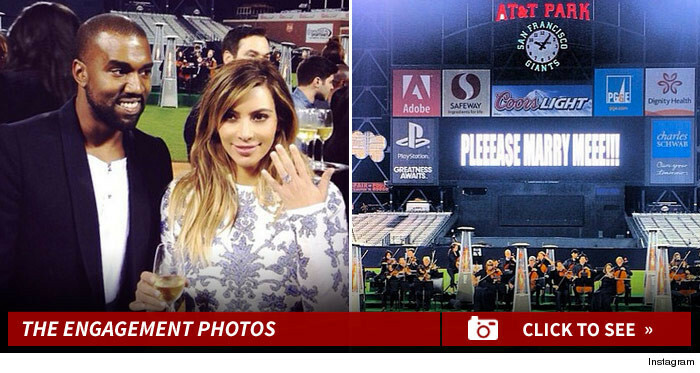 The couple sued Hurley, claiming he manipulated his way into AT&T Park in San Francisco back in 2013 to witness Kanye's proposal. He even signed a confidentiality agreement. But Hurley secretly recorded the video and posted it on MixBit. Kim and Kanye were furious, and their lawyer, Eric George, filed suit claiming Hurley was desperate to find a second act after 2 failed flops following his YouTube sale. We're told Hurley must pay the loot within the next few days, and then the lawsuit will be dismissed. $400k is a fortune to most, but Hurley sold YouTube for $1.6 billion, so he's not hurting.